Makerere University has suspended 17 students from the College of Education and External Studies (CEES) for engaging in examination malpractice and forging examination permits. Lawrence Kiwika, Martha Atuheire, Sharon Namanya, Angela Awori and Grace Kiyemba were suspended for two academic years for forging examination permits. 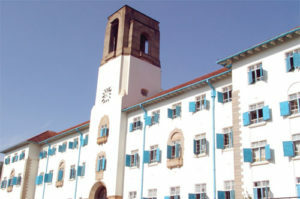 Four other students, incuding Alex Kintu, Elvis Oundo, Ruth Kayaga and Winfred Nnakyeyune were suspended indefinitely for forging examination permits while Oscar Dickson Omeka was also given a similar punishment for cheating in an exam. According to Tom Otim, the Registrar CEES, the decision to suspend the students was reached by the School of Distance and Lifelong Learning Examination Malpractices and Irregularities Committees (EMIC) early this month. He said there are four other students that were suspended for a complete academic year for cheating. These are Swabrah Nakyazze, Stella Bila, Racheal Lillian Kanyesigye and Shiforah Orishaba. Information obtained also indicates that the university has canceled the results of Cissy Kanyiginya, Hope Katushabe and Anna Mirembe and cautioned them against any more cheating. These will have to re-do all the papers. Additionally, 17 students have been summoned to appear before the Malpractice and Irregularities Committee on February 20 at 10:00am to defend themselves against related charges. Otim said the students are suspected to have sat for last semester’s exams without clearance from authority. They include Crescesia Awori, Miriam Namyalo, Hadijah Namuwaya, Jackline Nakiyingi, Peter Mutagwanya and Sidon Bigirwamukama. Others are Aggrey Ssali, Phiona Nassanga, Scovia Masia, Santo Iga Edward, Joshua Byamugisha, Lairah Olupa and Esther Namukabya. Also on the list are Bright Mugisa, Kato Hassan Kayemba, Irene Hope Cheruto and Shakira Nakisinsa. However, the outgoing Academic Affairs Minister Simon Wanyera has vowed to lead a strike in protest of the univeristy’s decisions. “The controversy here is that the same students paid their full tuition and obtained their permits. It makes me doubt the system and also the failure of administration to team up with the student fraternity to solve their problems,” Wanyera said.